It’s interesting that much of Ms. Kelsey Osgood’s memoir How to Disappear Completely is filled with warnings and criticisms regarding the plethora of memoirs pertaining to anorexia that are already out there. Osgood argues eloquently and convincingly that anorexia is a learned behavior and that most memoirs are nothing more than how-to text books for the young and vulnerable. Yet the very words How to are part of her title. And that, right there, is the rub. So what’s a young wannabe writer from a well-off, perfectly functional family to do? Especially when she believes that: “Death always seemed more romantic than well-decorated living rooms.” She decided to become anorexic. So she went to the library and started to read. It’s also a world not easily entered. One must be fully vetted by its fellow anorexics, and the initiation rituals are fraught with judgment—always the concern: Is she a better anorexic? Is she the best anorexic? Is she faking it? And this, Osgood warns, is the problem with the standard treatment of this disorder: placing a vulnerable needy anorexic smack down in the middle of other vulnerable needy anorexics is a recipe for disaster that only leads to the hungry feeding on the hungry. Once initiated into the world of anorexia, you can never leave—at least not intact. Even the struggle to recover is part of the romantic, poetic lure of anorexia—what doesn’t kill you will make you stronger. Osgood does a fairly good job of not creating what she so vehemently criticizes. Sparked with irony and dark humor, her writing is smart and effective. If her goal was to make herself worthy and substantial, and honest, then she has succeeded with aplomb. 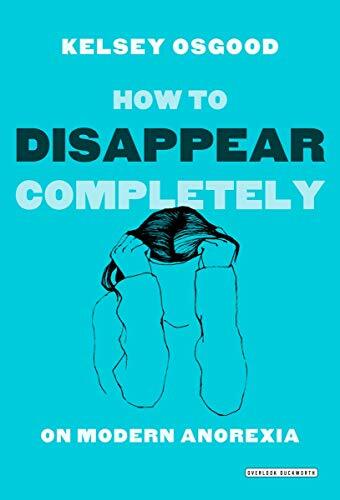 How to Disappear Completely is an excellent read for anyone who wants to better understand the complicated conundrum of vulnerability associated with anorexia and the ease in which a young person might fall haplessly into that tightening web of self actualization. Karen Winters Schwartz is the author of the novels Where Are the Cocoa Puffs? : A Family's Journey Through Bipolar Disorder, Reis's Pieces: Love, Loss, and Schizophrenia, and The Chocolate Debacle. She is the president of NAMI Syracuse (National Alliance on Mental Illness) in New York and advocates nationally for mental illness awareness, decreasing the stigma so often associated with these illness.